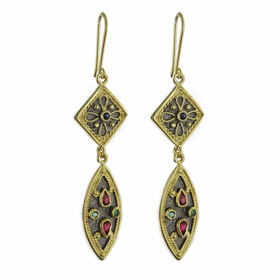 Inspired by museum pieces, this elegant 24K Gold Plated sterling silver earring set features traditional Byzantine jewelry style with a detailed floral pattern, and colorful gemstones. It is distinct, elegant, and hard to separate it from its counterparts made of 24K Gold and real gemstones. A true museum replica at an affordable price, handmade and imported from Greece. Approx. 14mm (0.55in) wide by 45mm (1.77 in) high.